The ship by date was Sept. 10th. Just curious but how many people haven't received yet? Clint, I got mine. I sent mine out to my recipient on the 7th. The tracking number says it was picked up almost a week ago. Haven't heard a thing. A little communication would go along ways. Starting to not look so good. Got mine this evening! Little Fiddle Woman says it is even better in person! I plan to put a few finishing touches on the edge, and put it in the quiver for turkey hunting! Thanks, Cabinetbowguy! 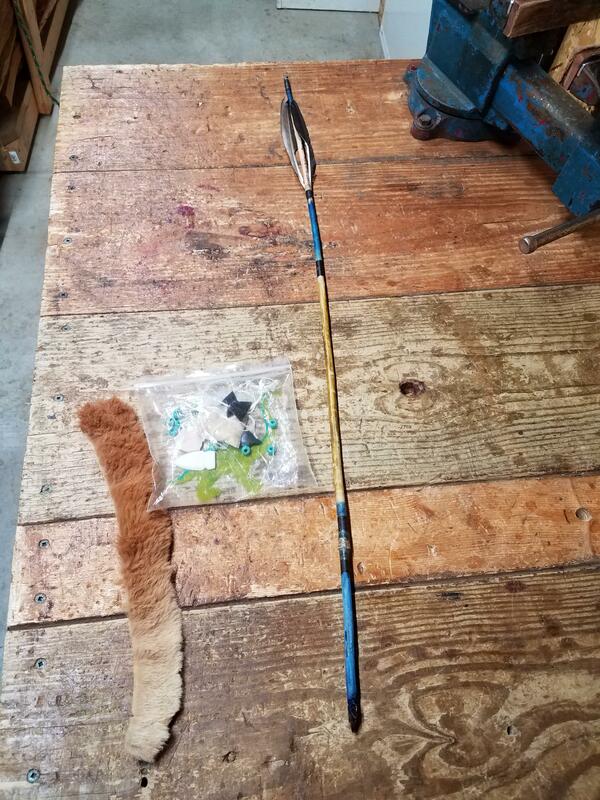 I received this cool all natural arrow and supplies from Spearbearer. The USPS did their best to destroy it. It has a fore shaft and goose fletching. Glad you got one Clint. I was hoping to hear from Spearbearer. I'm assuming the arrow I sent him was received. Looks like a nice arrow Spearbearer. I think everybody received if anybody didn't send me a PM. Well, I got a nice PM from Spearbearer. He said he received his arrow and really liked it. Sure glad it made it there in one piece. Think I got a few pictures somewhere if I can find em yet. Those are some nice looking arrows. Page created in 0.6 seconds with 27 queries.